Mayday greetings to the workers of the world! We have a short mayday-themed carnival to celebrate. First up, The World Socialist Party (US) has prepared a history of Mayday - Mayday 2008 is the 122nd anniversary of the American General Strike of 1886. Snowball, however, links to a piece by Rosa Luxembourg which dates Mayday back to 1856. Anyone wanting to resolve this historical problem should do so in the comments. At the Socialist Unity Blog, Louise writes about Workers' Memorial Day (April 28th) and notes some shocking statistics on work-related injury. Penny Red writes a Mayday article on feminism, class and abortion, arguing that feminism is beginning to rediscover its socialist roots. In America, May 1st is the National Day of Prayer - or the National Day of Reason, according to which camp you belong to. Better to ignore both and celebrate Mayday as a worker's day! Finally, around the UK there are elections today - most importantly those for Mayor of London. Stroppyblog has a pessimistic/realistic take, while The F Word simply says "Vote!". The subsequent time I read a blog, I hope that it doesnt disappoint me as much as this one. I mean, I know it was my choice to read, but I truly thought youd have something fascinating to say. All I hear is a bunch of whining about something that you possibly can fix for those who werent too busy on the lookout for attention. 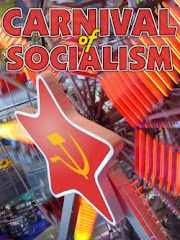 The Carnival of Socialism attempts to bring a fortnightly round up of everything that's going on in the global socialist blogosphere. If you're unsure of how carnivals work, take a look at our archive for previous examples.